It's 08:11 in Heavener, USA right now. Heavener SD I-3 A webcam in Heavener, Oklahoma - camera location: Heavener SD I-3. Waldron, Arkansas: Waldron High School, 28.9 miles away. Alma, Arkansas: Alma Intermediate, 46.4 miles away. Danville, Arkansas: Petit Jean River Valley, 69.3 miles away. Fayetteville, Arkansas: Mt. Sequoyah, 85.6 miles away. Fayetteville, Arkansas: Hotel Chancellor, 85.6 miles away. Fayetteville, Arkansas: Kessler Mountain, 85.6 miles away. Russellville, Arkansas: Skyline Weater Station, 87.2 miles away. 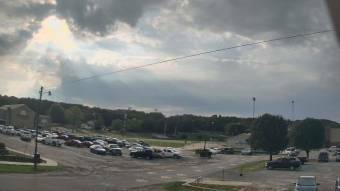 Siloam Springs, Arkansas: Allen Elementary School, 89.8 miles away.